Controversial, a global icon, a diva among divas—Barbra Streisand, the last genuinely unique show business personality of the twentieth century is the most honored entertainer in the world today. But along with the Tony, two Oscars, six Emmys, eight Grammys, ten Golden Globes, fifty gold albums, and wild acclaim have come wildly diverse reactions to a personality as outsized as her talent. In the words of Streisand herself, “I’m a liberal, opinionated Jewish feminist—I push a lot of buttons. In Tom Santopietro’s witty yet analytical look at this one-of-a-kind career, the myths and personal foibles are stripped away, and the focus lands squarely on the work. From the early recordings to the groundbreaking television specials, from the Hollywood blockbusters to the history-making comeback concerts, Streisand’s career is placed within an oftentimes uniquely American social context but always allowed to speak for itself. 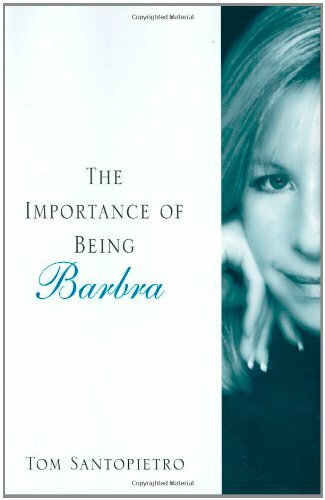 In a brisk, funny, and always compelling style, The Importance of Being Barbra reveals all the milestones in a new and sometimes startling light, ranging from the brilliance of Funny Girl and The Broadway Album to the misbegotten yet curiously popular A Star Is Born. Treating Barbra Streisand like the serious artist she is – and has always claimed to be – The Importance of Being Barbra delves into the key reasons for her all-encompassing success: the overwhelming ambition, the notorious perfectionism, the fervent gay following, the dramatic pull of a voice and style that mysteriously connect with the lovelorn all around the world. A full-scale examination of the acting, singing, and directing that have ranged from the dazzling to the occasionally inexplicable—it’s all here for anyone who has ever wondered at the phenomenon that is Barbra Streisand. …a refreshingly different look at Streisand and her ongoing appeal. …a balanced assessment of her career and the personality, both it assets and liabilities, that has gone into shaping her stardom. …a serious, smart and amusing study of her career, rather than her personal life.